Although decoupled in time and space in the ocean, the silicon (Si) and carbon (C) cycles are closely linked. The role played by these elements in climate and marine ecosystems is essential and their biogeochemical cycle is undergoing dramatic changes. MuSiCC, proposes to bring unique know-how, developed abroad by the scientist in charge, to Université Pierre & Marie Curie, a leading French university. MuSiCC is based on the implementation of an advanced multi-proxy approach integrating several temporal scales and processes. Two distinct research axes are proposed. Scheme representing MuSiCC research Axis I. The boxes represent the methods applied and the information that can be obtained from the proxies. Underlined text refers to the new proxies and information transferred to UPMC, plain text to the expertise already present at UPMC-IPSL and italics to the expertise to be carried out by international collaborators. Scheme representing MuSiCC research Axis II. 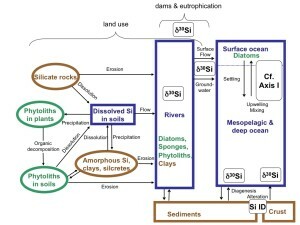 This scheme is based on the biogeochemical cycle of Si adapted from Meunier et al. (2001). The boxes/ellipses with bold lines represent Si reservoirs at the Earth’s surface. The plain rounded boxes represent the sites where MuSiCC proxies will be applied. Shaded rounded boxes depict the thematic expertise of partners. What is the contribution to Si cycle of sedimentary diagenesis in the continental margins? 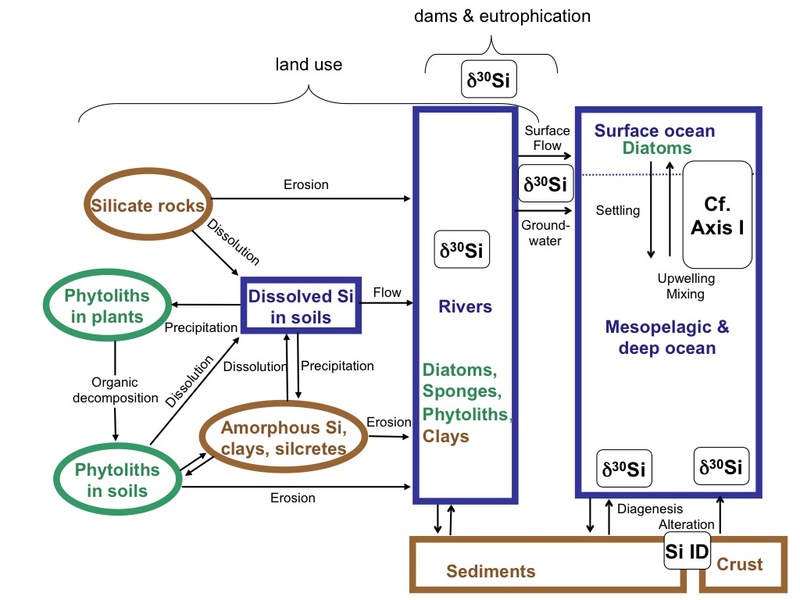 What is the contribution and fate of riverine biogenic silica fluxes to the ocean? How do anthropogenic pressures affect the Si cycle in estuarine and coastal zones? the coupling of these Si-focused proxies to other relevant for N and C cycles, e.g. 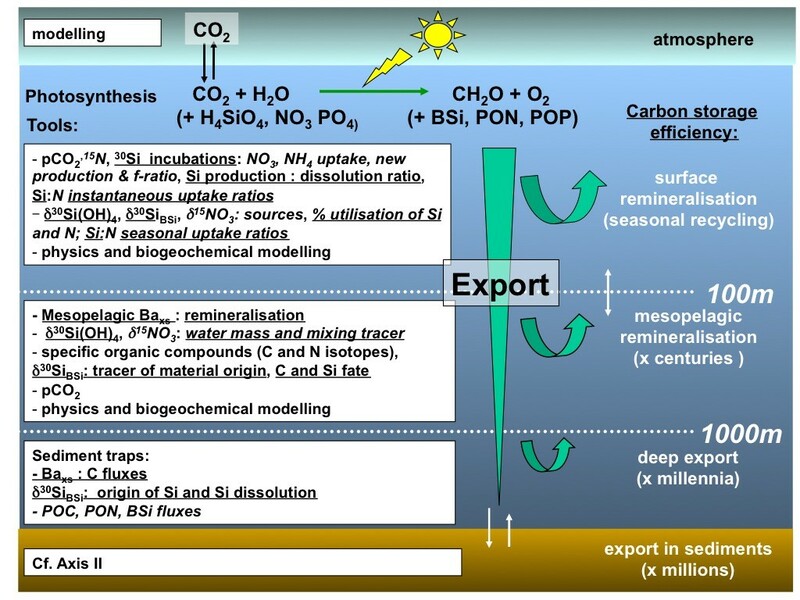 15N and 13C enriched experiments, natural composition of δ15N and δ13C (in a similar approach as for Si proxies above), 234Th deficit as a tracer of mixed layer C export, mesopelagic barium as tracer of mesopelagic C remineralisation, in addition to standard measurements (Particulate Organic Carbon and Nitrogen, chl-a…).